I'm not sure. I do agree that both of these titles are more accessible than Moon Over Manifest, but I had issues with both. I liked Turtle... until the end, as well. But, it didn't last with me. I read it, it was fun, and then I moved on. I also didn't get the One Crazy Summer love, either. I liked the sisters -- loved their relationship -- but again, the ending didn't sit well at all. Interesting choices, to say the least. I did love One Crazy Summer (the characterization especially) and would have been very disappointed if it hadn't been honored. But--I think Conspiracy of Kings should have won the whole thing. Ha! I, too, could not skim these books. Turtle's snarky voice was a delight to read, though I also thought the ending moved a bit too quickly. 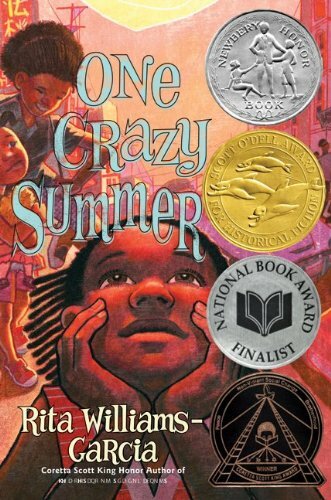 I was so impressed with One Crazy Summer, especially how Rita Williams Garcia gracefully integrated the characters into this turbulent setting, as the 1960s multicultural issues were written with a sophistication that I, as a multicultural reader, eagerly welcomed. But what hooked my heart was following Delphine's struggle to protect her sisters while she developed a quietly poignant relationship with their mother. @Anamaria - I totally agree about Megan Whalen Turner's A Conspiracy of Kings! I'm reading One Crazy Summer now and haven't read the other two, so can't say specifically. But I did work on our state's book awards one year and they were pretty good about dividing all the books we read into categories so we wouldn't have too many of the same books in the final voting. These three books would have been in the same general category and we would have had to pick one to go up against the others in final voting. It's tough sometimes, but it works for us. You verbalized my own thoughts about both of these books just about exactly. Though I was personally a little more taken with Turtle Island. I also noticed that the Newbery winners and honors were all, with the exception of Joyce Sidman's wonderful book, historical fiction. Love your opening - yes, this description could fit either book, but these writers created such distinct characters, such distinct voices that they are memorable stories. I especially liked Turtle's snarky, spunky attitude. 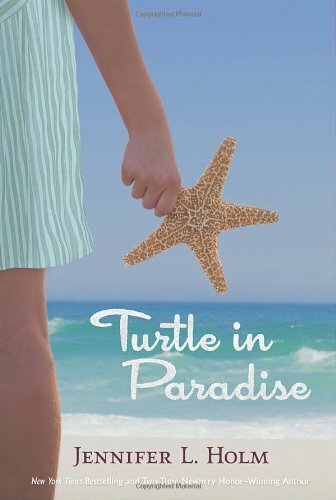 I haven't read "Turtle in Paradise" yet. I really want to, even more so after reading how much you enjoyed it. But I did read "One Crazy Summer" and had a really huge problem with it. I found both of the parent characters really unbelievable. Perhaps I'm just naive, but would a father really put his three very young daughters on a plane by themselves (during such a tumultous time period) to visit with someone who abandoned them for a whole month? Because "it's time" for them to meet their mother? That seemed very forced to me. And the mother is completely disinterested in her children. That also rang untrue to me. You gave birth to these girls, and raised [at least Delphine] for years, and yet you seem to have no maternal instinct. Now, her forcing the girls to be independent by refusing to care for them really comes in handy when she's sent to jail, but that's not an excuse to me. I felt like she was a forced character too. Delphine and the girls I loved. And the narrative voice and setting felt authentic to me. I thought it was a good book overall, but I feel the need to point out the flaw that both the parental figures in the book were, in my opinion, unbelievably irresponsible. Turtle was a fun escape to another time and place! And what a spunky and memorable main character! Really enjoyed this one for being unique and funny.